Shoot me an email at redoaklines@gmail.com, and I’ll send you some scrapbook goodies to play with. …so how in the world did I turn a wedding theme into a Halloween theme?! I misted various shades of purple and green all over my patterned paper; pretty simple, right?! Also, on the black flowers, I added pops of red using Stickles. Anyway, enough about my layout, let’s talk about yours. Use the above sketch, and you could be entered to win a handful of goodies from Imaginisce! Remember that the products you use need to be mostly Imaginisce products. Happy Scrapbook Day to all of you creative ones! Happy Scrapbooking Day to you too, Sarah! In the midst of some Mother’s Day stuff, so it is a good day! My fave part of this addiction is, I love the faces of family and friends when I give them something handmade! Happy Scrapbooking Day to everyone. My favourite part of scrapbooking is shopping. I love finding new things to try. I love creating layouts with the new things i’ve bought. Happy NSD to you too! You rock girl! 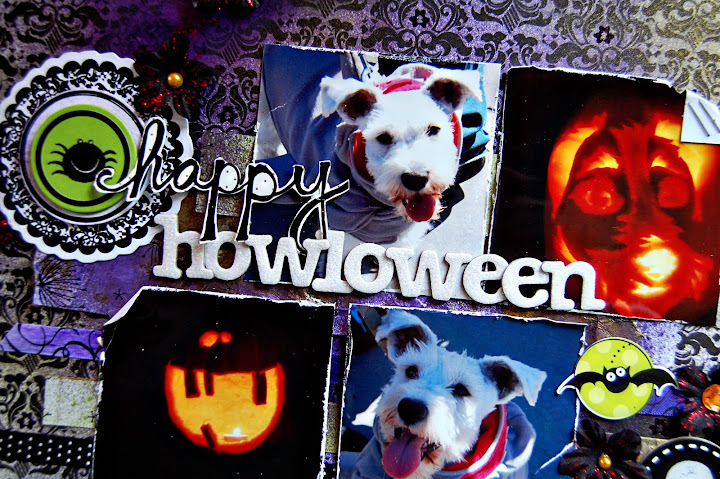 I can’t believe you made wedding papers a into Halloween page!Fabulous! Fun layout! I already subscribe by email! My favorite thing about scrapbooking is that it makes me FEEL creative! Thanks for a chance to win! Happy NSD to you!!! I love how you turned the wedding sketch into halloween (getting married is pretty scary! LOL! I should know – i’ve been married a long long long time!) Hope you have a great weekend! Remembering the memories older photos bring, since I only started scrapbooking about 3 years ago. Can I Participate of your blog candy too even from Brazil? I hope so and crossing my fingers on that! Hello, again, Sarah! I forgot to tell what is my favourite part of scrapbooking is: to make my Lay Outs, I love pages! Happy National Scrapbook Day, again! I love your excuse… I am going to use. it.. Happy NSD! my favorite part is watching my children, grandchildren and my mom when they look at my LO’s. I love the stories that my LO’s are telling and that now those stories have a way to be remembered and told. My favorite part about scrapping (other than the shopping!) is having a finished product that people can look at from years to come! My favorite part of scrapbooking is seeing the results, and being able to share them. Love your layout Sarah! It is really fabulous. You are such a sweetie to list all of our names to make it easier to hop. Must remember to do that next time. My favorite part of scrapbooking is knowing I am leaving a creative way for my daughter to look at her pictures. I feel like she will appreciate it more than a regular album. Woops, think I commented on the wrong post! Love your Halloween work with that paper. Great work Sarah and happy NSD!!! My favorite part of scrapbooking is all of it! I love what you did with the sketch! My favorite part of scrapbooking is that there is no limit to what you can do. It’s just so darn fun! Happy NSD! 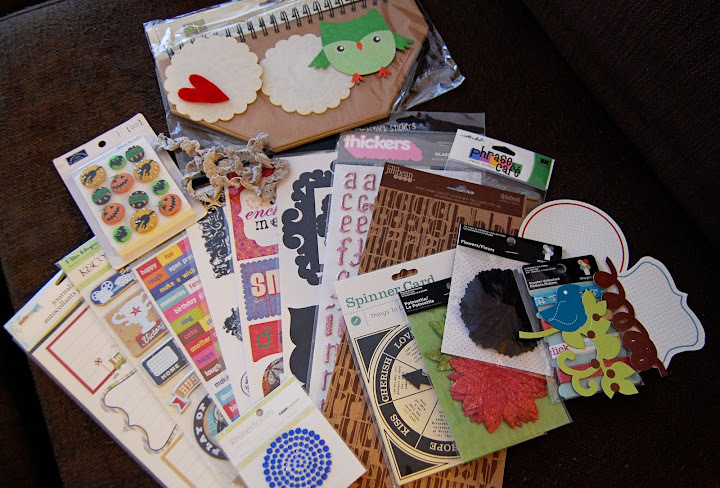 My favorite part of scrapbooking is the love, creativity and fun I put into it using my stash of goodies! AWESOME take on the sketch! Can’t wait to play with it! I am hopping along to get some more inspiration! Happy NSD! Have a GREAT Day! Happy NSD to you as well! My favorite park of scrapbooking is when I look back at a project that I made months or years ago and it makes me remember everything about that day. I don’t ever want to forgot these times in our life good or bad and I think it is so awesome how these moments live on forever. I love your take on the sketch too! Super cute! Thanks again! I love pattern paper and I love to take pictures! I’m a paper addict!!! Happy NSD!!! Happy NSD dear Sarah!! Lovely layout, out for pub soon, that’s for sure! My favorite part is preserving the precious memories. My favorite thing about scrapbooking is all of the wonderful friends I’ve made. I have made BEST friends with people across the country. It’s a truly wonderful hobby! Happy NSBD Sarah. Your Halloween layout is DARLING! Seriously cute! Sarah, I always love your layouts and this one is no exception! Awesome! My favorite part of scrapping is remembering the moments. now, off to visit the other blogs! What a great day this is! I’ve been crafting and reading and finding inspiration everywhere! Thanks for continuing to bring new ideas to the front! Your LO so fun and the dog is si cute! What a great little RAK your giving away!!! Happy NSD!!! I love scrapbooking because it helps us to remember stories we might otherwise forget. IM LOVING THE SKETCH! Your take is FABULOUS! Also I love to scrapbook cause it gives me a chance to reflect on the things that have happen in my life. Cause you know during the moment it goes by so fast. Happy Scrapbook Day to you, too! I love your cute Halloween pages! Happy NSD Sarah, love your layout and very generous giveaway! My favorite thing about scrapbooking is taking time to reflect on my memories of days gone by. How often in our busy schedule that we forget to think of the moments that past by us. I am primarily a card maker but am now getting into scrapbooking my daughter’s school years layouts. I am very much a beginner and appreciate sketches and examples!! I love how scrapping relaxes me and the joy of looking back at all my pages. My addiction to scrapbooking started to grow when my kids started scrapbooking with me! Love scrapping with the kids especially the younger ones because the have no bounds to thier imagination! Happy NSD everyone! Happy NSD. My favorite part is I get to put together albums that my kiddos still like to lookat even as teens. and it relaxes me. What great goodies! I’d lvoe to win. My favorite part of scrapbooking is playing with all the products while preserving my pictures and memories. What a great blog! I’m so excited I discovered you! Happy Scrapbooking Day! My favorite part of scrapbooking is having all my memories organized in a fun way that everyone can enjoy going through & remember back to all the fun times. I like how you used it for something different. It is a great layout. I scrapbook because I love to do something creative and fun with all the pics I take of my boys. I hope they will one day appreciate all of the work (and money) I put into it. beautiful, i love this LO! Awe, this is super cute! 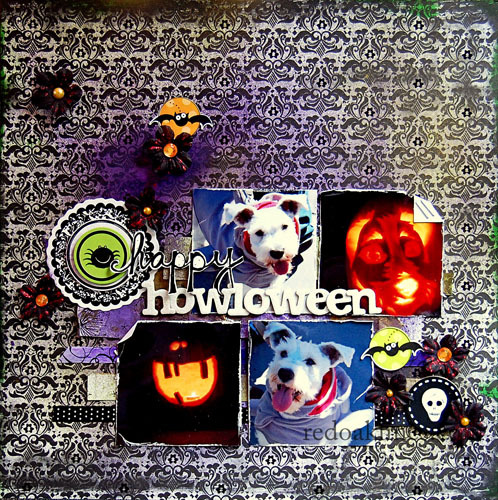 I totally love how you changed that paper to make it a Halloween LO! I scrapbook because I love to be creative with anything, I love taking pictures and I love having the memories to look back on. Oh, and I love to buy Paper!! My favorite part of scrapbooking? Hard to tell. It’s simply FUN! I love that it makes me happy! I had a great time Scrapbooking today All day and thought it would have been fun if you were there…. I got home and wanted to send you greetings for up here. have a nice rest of the day my friend! Today is indeed our day! Happy Scapbooking Day to you!!! My favorite thing about scrapbooking is when looking at a finished product it takes me to that memory and I can share that with friends and family! Have a great weekend!!! Subscribed and shared with my friends the great news! My favorite part about scrapbooking is the feeling of accomplishment when you look at the finished product. My favorite thing about scrapbooking is watching my 18 year old daughter show the scrapbooks I’ve made for her to her friends and her trusting me with the pictures she has taken of the concerts she’s gone to. My favorite thing about scrapping is the look on the faces of the kids when they read the journaling that goes along with the photos and pretty paper – sometimes it’s priceless. Also love making and giving handmade gifts to friends and family. My fav thing about scrapbooking is the creative process. My favorite part about scrapbooking is definitely the picking out of supplies 🙂 I do it to remember all the fabulous and sweet things about my children. Happy NSD!! My favorite thing about scrapbooking is preserving memories, we may forget as time passes on and using those memories with such wonderful and inspiring products. Simply can’t get enough! Happy NSD!!! Nice giveaway…My favorite thing about scrapping is being creative to preserve wonderful memories. I love scrapbooking for…..well, so many reasons. There’s all that great paper to play with, which my mom has said i’ve had an obsession with since i was a child 🙂 Of course i love preserving my familys memories, new and old. And i’m usually doing this hobby while spending time with friends, and what could be better than that! There’s all the pretty papers to use and scrapping just relaxes me while i let my creative juices flow. Gorgeous papers 🙂 And i love knowing that when my teenage boys don’t think i’m paying attention, i see them looking through all the minis and pages of them that i’ve created. Hmmm…oh, and did i memtion the fabulous papers!! I love watching my childrens’ faces when they sit down and look at their books… Or even better when they show them off to their friends! My favorite part is recording the memories! 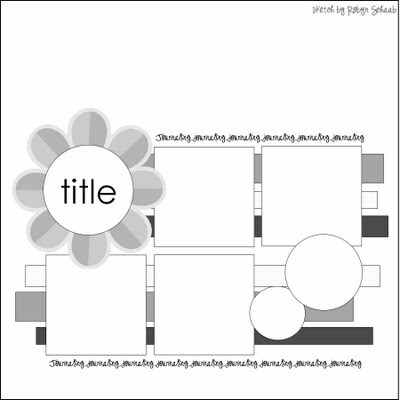 i love scrapbooking i started about about two years ago and i learn more everyday. It help me keep family memories alive. And love all the papers and new thing coming out. My favorite part about scrapbooking is reliving the memories and then recording them. Great layout. The best part of scrapbooking is using all the cool stuff that keeps coming out. Sarah, I love your Imaginisce layout! It’s such a fantastic use of that paper! And you know I just love your furry friends! Very creative use of the To Love & Cherish line. I love to scrapbook because it allows me to be creative and relive my family memories at the same time. My favorite part of scrapbooking is: the creative process. I love bringing all my scrap goodies together to create something that is uniquely me! happy national scrapbook day!! it looks like you had an awesome one!! I looove the cute halloween layout!! Hope everyone had a greadt NSD, I know i did, wow oh wow would I love to go to that fabric place am a sewer and love fabric, love the embellishments….. I truly enjoy the process of this hobby. Buying new fun stuff and sitting down and creating is so rewarding. I love creating artistic renderings of our lives via scrapbooking! Oh love your Imaginesce page … so striking and dramatic. This is a great sketch, definitely going to give it a whirl. Love what you did with the sketch! How very clever of you to mist the paper to give it a Halloweenish feel. Love it! Hi there – like your take on the sketch and that you totally changed up that paper to suit your photos and theme! Love what you did with the sketch! I love the creative outlet that scrapping gives me. Wow, I love that LO! So fun that you used wedding paper!